Our evacuation chair training course is aimed at any members of staff that may need to use this piece of equipment to assist with the evacuation or someone with impaired mobility in the event of a fire. Fire safety legislation requires that there is provision in place for the full and final evacuation of a building, this includes those with physical disabilities preventing them from using the stairs. Using the customer’s own evacuation chair we are familiar with most makes and able to teach staff members how to use the chair, including transferring on and off of it. How do we approach evacuation chair training? We’ll provide delegates with a variety of printed course materials including workbooks and handouts. On successful completion of this course delegates will receive a printed courses certificate. 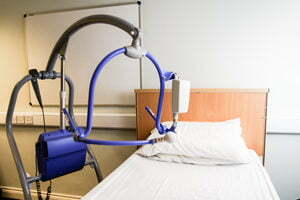 Our ‘evacuation chair’ course is just one of over 60 courses we offer. Acorn Health & Safety provides training and consultancy in first aid, fire safety, food safety, manual handling, healthcare training and health and safety.